We bring back our Made in Insti series this year with a plan to cover the innovation ecosystem at IIT Madras. Beginning with startups by our recent alumni and followed by information on the interaction between various stakeholders of this ecosystem, this series aims to inform IITM’s student community about the opportunities made available through this ecosystem and connect them with the journey of fellow IITians who have started swimming towards their own magical islands. In this article, we interview Tanuj Jhunjhunwala a.k.a T-Dot, who graduated from the mechanical engineering department in 2014. While in campus, he took an active part at CFI and Shaastra, served as the Co-curricular Affairs Secretary from 2013-14 and was awarded the best DDP award for his pipe-inspection robot. Featuring on the institute calendar’s chosen projects for his DDP and then Planys, Tanuj and team have made significant in-roads in a rather difficult and hi-tech industry of underwater inspection. They also made it to the final round of the prestigious ET startup awards along with 3 other IIT M startups among 5 in total. Can you tell us about how Planys began? Planys was born about a year back right inside the IIT Madras campus where we had our first office at MDS. Before we started Planys, we were basically two different teams working on similar projects. Vineet, our CTO, was heading a Autonomous Underwater Vehicles team at CFI; and the team was taking part in the international competition at San Diego. They iterated over an entire year, took part and won the national qualification rounds and went on to represent India in the competition where they stood 15th internationally. Taking inspiration from them, I did my DDP under Prof. Prabhu Rajagopal and Prof K Balasubramanian (also Dean ICSR) where we built an underwater robot thatcould perform advanced non-destructive testing and analysis. That created a lot of excitement in the oil and gas industry. We showed it to companies like Reliance and they started thinking of various other applications of our technology in their industry. Moving further, we collaborated to form Planys to carry forward our work. When we were talking to prospective clients, we realised they did not understand the concept of robotic underwater-testing at all. It was alien to them. To create an impact in the first meeting and remove their apprehensions, we thought of building a prototype. So on a shoestring budget and with a 4 member team, we built ‘Mike’ in around 4 months’ time. We started giving demos to our clients using Mike, which is a very basic robot with usual payload and sensor configuration. We got a lot of positive feedback for Mike, but we started realising a lot of limitations when we were testing Mike out there in the open sea. It didn’t have a lot of capabilities like ultrasonic thickness measurement, spot cleaning and acoustic mapping, that our clients wanted, which are currently done by divers constrained by depth and hazardous environment. Robots come to rescue in such a case. In India, ROVs did not exist earlier. There are deep sea ROVs weighing in tons, which are used for oil and gas exploration. They can go up to depths of 3-4 kM, but cannot use these ROVs if you want to get work done at sub-kilometer depths. To give an analogy – to kill a rat, don’t bring a tank. So, we built Mike with that intent and based on the feedback, we came up with the next generation ROV after a 6 month production cycle. We kept on iteratively upgrading the technology to check the boxes off from the list of things Mike couldn’t do earlier. What you see now is probably the 16th version of Mike itself and it has performed over 500 hours of testing in the sea. We now clearly understand which components fail in how much time in seawater and what kind of maintenance is required for Mike. Where does CFI fit into the picture of Planys and what other groups have shaped and helped you along the way ? The majority of our team got experience from spending days on different projects in CFI. Not only did we gain an acumen for underwater robotics, but also learnt debugging and working on high level system integration problems at CFI. In that way, CFI has been a big boon. The NDT aspect, on the other hand, requires sophisticated labs for R&D due to its high-tech nature. Our association with CNDE and the research park in the backyard of IIT Madras helped us through that. 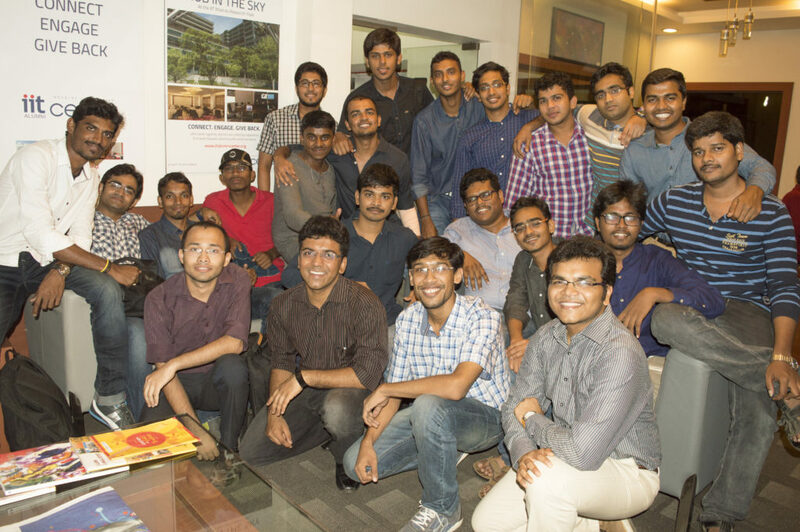 In a way, we have utilized the IIT Madras ecosystem to the last ounce. We are incubated at the IIT Madras Incubation Cell. They helped us a lot with mentorship, and more so with the financial and legal services which they offered. It really helped us because starting up directly after graduating from IIT Madras had not prepared us enough for the legal system of India. For the past one year, we have not had any issues and they have helped us with everything on that end. We work very closely with Center for Nondestructive Evaluation at Machine Design Section, IIT Madras. But very importantly, we are in touch with a lot of alumni. They are the ones who connect us with decision makers in our target client companies. Getting the right meeting is a game changer. Not just that, they have really mentored us in this journey as B2B is a tricky business to be in. They have helped us with strategy, pricing, pitching and many such concepts. Lastly, it is the team which deserves the credit. All credit to IIT Madras and Center for Innovation in particular. There will be a time to give back as well (chuckles… ). A lot of people have left well-paying jobs in top automotive, R&D, FMCG and consultancy firms to join us in varying capacities. We have also taken a few interns from ED department who did their 6 month long project with us for developing Mike. We look forward to continuing that engagement. How do your ROVs work? We have our robot (also called remotely operated vehicle or ROV), which acts as a platform where we can integrate various sensors as per client requirements. Take an example of a car. You can ask me to change the upholstery, the music system, the headlights and I can do it. But I cannot change the engine or transmission system for you. So at one level, we can add or subtract sensors for our clients. But, if a client comes up with a very specific requirement where they want a small size factor or a robot which can go upto more depth, we need to design the robot from scratch. Our ROV collects data which we analyse and give back to the client, in the format they prefer. Over the last one year, we’ve built two ROVs. The first one is Mike, which was more a proof of concept and later modified for commercial operations. We took it around to clients, showed them what it could do, got their feedback and iterated a lot to come up with the next version which will be released very soon. The design is indigenous and has evolved over four years. We get it manufactured by select vendors, integrate and test it in-house. We have our own crew team which does the services. When a client calls us, one of the team members goes to their site to understand the requirements and conditions. A date is scheduled and we customize our vehicle and take it there. ROV captures the data for us to analyse and final report is given to the clients. They have been really fascinated by the format of our reports; because we do not just give them a textual report but also a software report. We have designed a proprietary software to ease data visualization which allows you to go to the GPS location and depth of your choice to see the condition at a particular time, thus integrating micro and macro level trends in data. This novel visualization process has added a lot of value to our clients. So, our technology framework has ROV as the platform, onto which sensors are integrated to capture data which is then analysed and submitted as a software report. We are developing state of the art algorithms to analyse the data. For example, video enhancement is very important in Indian sea water as it is very turbid, being one of the reasons to why international players are not entering this market. Ours is a HaaS model – Hardware as a Service. Our product is ready to be sold any day we would want to, but for now, we are using our product to provide service to the clients. What kind of projects do you work on? What projects are currently underway? 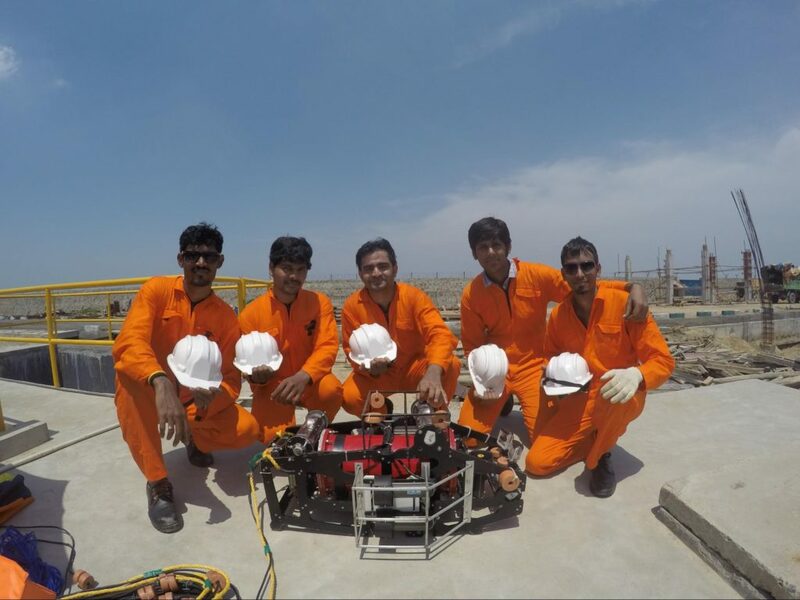 Planys builds underwater robots for inspection in sectors like oil and gas shipping where we inspect different kind of underwater structures.We are also looking at new areas like dam inspection which are currently unexplored in India, along with environment monitoring. We are also looking forward to be associated with the Clean Ganga campaign. After cyclone HudHud struck the Vizag coastline, it collapsed 3 off-shore tank terminals. They called in foreign consultants who advised them to demolish everything and rebuild from scratch – setting them off on a project which would have costed them 200 crores. One of the professors from the Ocean Engineering department in IIT Madras said that if he is given the exact configuration, he can rebuild a wall around it to reinforce the structure at lower cost. We were asked to do the depth and corner mapping of the structure and the visual mapping of each face of the structure. Recently, we got to know that the professor’s recommendations were implemented by the authorities. We have done a lot of projects with private chemical companies, for jetty inspections, in shipyards for floor inspections. We did a visual inspection of ship hull at the Chennai Port. In another project, we spent 2-3 days to do a complete mapping of walls of a channel through which ships enter the port from the sea. They were really happy with our service and it was a good learning experience for us. Divers cannot go into confined places as they tend to panic when oxygen reduces and they cannot come up to the surface in time. This raised a problem – what will one do to inspect 1-2 km long pipelines? It is practically impossible to inspect them from the inside. We realised that our ROV can provide a critical value proposition. We did a pilot project with a company where we sent Mike 60 meters into both the ends for demonstration purpose. We will next be inspecting the entire pipeline for them. So, we have done about 15 projects with Mike in the last 1 year, and taking it into the industry has taught us many things. We are learning about pain points our clients are facing and looking at them as opportunities where we can add value. Can you tell us about your team and how you divide the work within the team? We have three broad functions right now. One is the product team, which is shortly going to be structured into the engineering team and the research team. Currently, since we are a small team which is focussed on building the next generation of Mike, we are a single team. But after that, we will put in place two independent synergic teams. The research team will primarily focus on the new technologies which will be brought to a stage where they are ready to be handed over to the engineering team which then picks it up, puts everything together in a product, iterates over the design and debugs everything. The engineering team would have further parts like software, controls, electronics, mechanical systems, NDT etc. Second, the operations team: it is the most important team in Planys as it provides the services and faces the clients. If we cannot execute what our product is capable of doing, everything is lost. So, we have got two experts with experience in international ROV companies on board. They are nice and very energetic, and their job is to pilot our ROVs. They also help us in benchmarking with international players in the market. 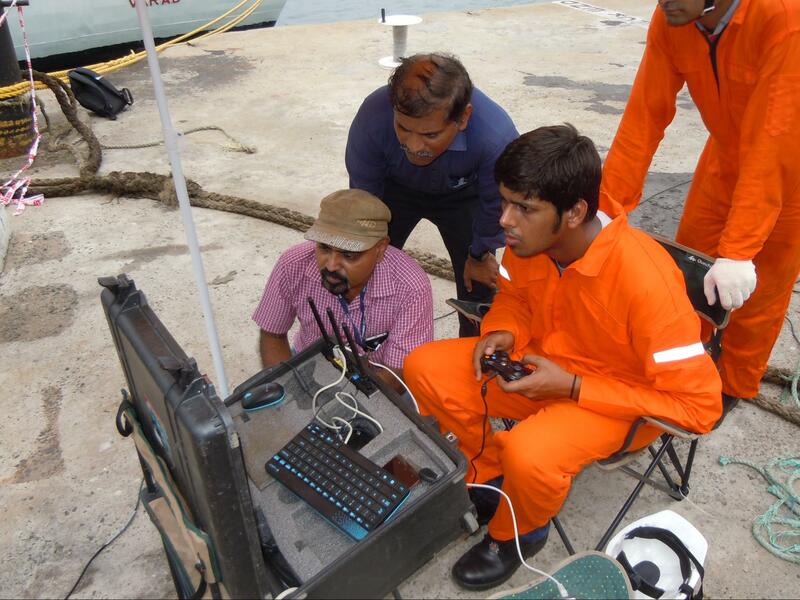 Among us, Vineet has experience in handling the ROVs . He has built Mike and is our best pilot at the moment. The other two guys have piloted much bigger vehicles and are picking up very well with our vehicles . We have not taken anything out of the shelf, we have created it by ourselves from scratch, with some specific outputs in mind before designing. 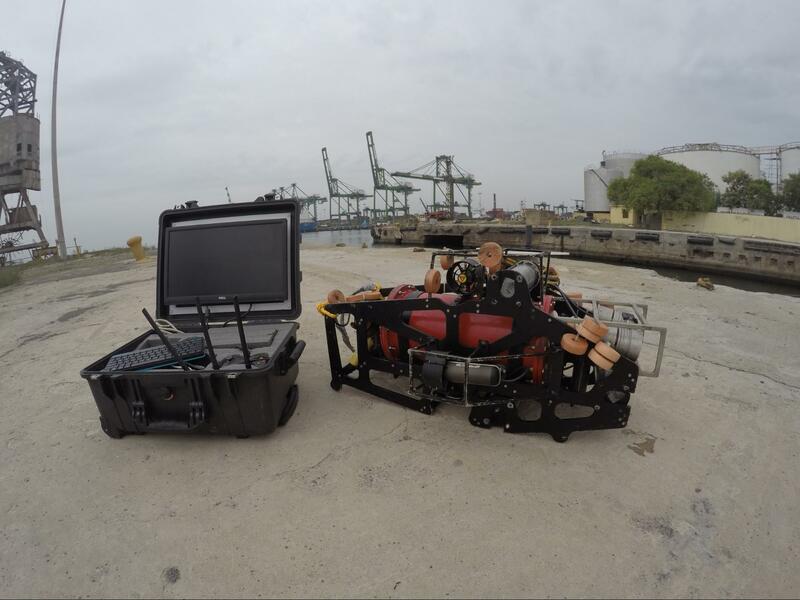 Hence, we have not followed the templates which are probably followed globally and hence, our ROVs are very different with a difficult learning curve in controlling them. Not everyone can control it, especially not without hours of training and getting acclimatized to the operations. Lastly, we have the business development team which takes care of B2B sales. Mind you, it is very difficult. We are not selling a product or a service. We are telling them – “Hey, did you know that you do not need to send divers to inspect your underwater pipes? Our robots could do that for you”. So we are really selling a new concept to an industry which might not have caught up with tides of the time. Huge industries tend to move slowly. We come to the rescue where there were no solutions earlier. What would you do to check for leaks in a tank in a nuclear power plant? There is a risk of radiation in such a hazardous environment, we cannot send humans but such cases or events are not commonplace. So our business development team has to sell the concept to potential clients. Our clients don’t even know that they need us. They might not be looking out for solutions and come browse our website. It is we who approach them and show them the value proposition. There are some applications which we ourselves didn’t know or expect earlier. There are other few which we want our R&D team to solve. Meeting with Senior decision makers of various companies is critical which elicits a lot of preparation from our end. Giving a demo to our clients is a really powerful way of making our case. Finally, our portfolio of projects coming up is really good and we are looking to hire more people. Our current strength is 25 and we have learnt that undergoing one full product development cycle is a good induction process for anyone who joins Planys. The people who came in at January are now very good in all sections because they got to work on our new ROV. They understand design, simulations, manufacturing, testing, debugging– each stage of development really well. Similarly, we want to hire more people just before our next project starts. This way, we can build a pipeline of having more people with good experience in taking up projects. At the end of the day, we are in a very customer-driven high-tech service industry where we not only build our standard robots but also design robots from scratch for some big customers. For example, a big oil and gas company in India wants a really advanced solution to test flooring of their oil reservoir. Without divulging technical details of the project, I would like to say that no one in the world has done anything remotely close to it. We have bagged the project and it will be commissioned over the next two months, spanning over 3 years. This is an example of a customised solution which we build for our clients, not just a robot. There are two such big projects, one has come through, and other is in the proposal stage currently. All this is apart from the services which we are doing from our standard robots. These are the two forks of our ventures right now from business development end. So, this guarantees a lot of learning for everyone on the team and the crew. Building a product which doesn’t exist anywhere else in the world is going to be a roller coaster ride. There are a lot of unknowns which we are figuring out on the way as we proceed. Many startups tend to avoid B2B system because of that reason. How do you tackle it? Our vision is building next generation under-water robots with high level of inspection capabilities. Anywhere we go, we make sure we pass on this particular message to our clients. No one is even attempting to do what we are doing. We are looking at making robots for military purposes. India has such a long, unguarded coastline which could use our robots. So, we are really motivated by the possibilities of what we can achieve by playing the B2B game, and hence are focussed enough to overcome the bureaucracies in the system. There is a small B2C hobby market for underwater inspection in which people want to test whether the hull of their boat is in proper shape or not before going for an afternoon of fishing in the neighbourhood lake. That market is really small in India. It will be challenging to strip down our product in order to build a strictly consumer product and we would not like to do so until we see real tangible benefit out of doing that. It is better to diversify in different segments while playing the B2B game. For example, no one has thought of inspecting the depths of dams. Think of it — how would you do it? Divers can only go till 20 or 30 meters depth, whereas you need 80 meters in most cases. Most dams are located in the remote areas and access to these by roads is challenging. That is one way of diversification. Lot of government projects are coming up where they want to build water highways by leveraging extensive river network. That will again open up opportunities for inspection/survey work, where we can add a lot of value. What will stop the bigwigs from outcompeting or disrupting you? We are operating in a high-tech industry. At the product level, you need to ensure that you get the system integration perfectly. You need to custom-build and fit together the software, the electronics, the mechanical system to function with very high reliability every time. You face a lot of problems in real-world testing which you iron out only after hours of persevering efforts. For example, at very high depths or high speeds, the electronics heats up due to heavy currents. To prevent that, our electronics needs to be robust and reliable. Another component is the advances Planys is making in the field of advanced non-destructive testing. This expertise in inspection has been built over months, if not years of work of very smart individuals; and that cannot be replicated overnight. Two faculties of international pedigree in this field are in our team. I would say we have done well in these fields and put together a coherent system which gives clients the expected reliability levels. So, it is not impossible to outcompete us, but very very difficult.We will ensure that we keep investing resources in cutting edge research to keep us ahead of the curve. A lot of other IITs also have underwater robotics teams but it takes a lot to go from ‘knowing something’ to ‘doing something’. I have built two prototypes. Vineet and team has also built two prototypes. We know what it takes to actually build a product and we have also been through the process of building Mike. Lastly, it is the skill sets. In India, it is difficult to come across people who have the necessary skill sets and interest to work on high-tech robotics. There are 65 teams in India which take part in ground robotics competitions like DRDO challenge or Robocon. But we function in the underwater robotics space which is very very niche. So very few people have the acumen and experience to work in this field. Trust me, experience is much more important than what we think when it comes to debugging, or hacking our way through practical problems. Having been in the robotics industry, what are general trends which you have observed? In our space, autonomous underwater robots are the next big thing. Research is happening across the globe in labs. We have also built one autonomous underwater robot. In the next 6 to 7 years, remotely operated vehicles may become obsolete and give way to autonomous systems, for any kind of inspection. Currently, it has already made inroads into defence and environment monitoring areas, but I foresee a lot of other features which will be retrofitted. Technology wise, we have reached a few bottlenecks too. For example, high speed wireless data transmission is not possible under water. Even submarines cannot do that. Our clients probably want it yesterday, but we cannot do that reliably at enough speed. So, for this entire industry to develop, communication technology needs a lot of advancements to function under water. How do you manage IPR? Being a tech company, generating IPR is one of the most important activities we engage in. There are two angles to it — firstly, it is your design, and you want to show that you are capable of producing cutting edge technology and products. Secondly, you also need to protect it. What if somebody patents it and then stops you from working on your own design? So filing patents is very important for us. IP is an important yardstick to judge the performance of a tech company. We published a couple of papers in an NDT conference where underwater inspection is a new field of research. Few scientists came to us and mentioned new applications for our own technology — something we would have never come across had we not gone for the conference. Not only does it spread the word in apt circles, it also brings in research from other parts of the world to our company. Any special breakthrough or milestone for the team? It is a small team, we celebrate every small milestone. (Pauses). We recently completed one year of operations. A very big milestone for us would be the launch of the next vehicle, which is the best vehicle we have made till date and the entire industry is waiting to see what we can do. We have got a lot of interest from Singapore specifically, it being the logistics and shipping centre of the world, creating a market for underwater inspection. I have made a few trips to Singapore and received a really positive feedback. Like this, over the next two years, we are looking to expand to different strategic geographies. So, it is tough to choose just a single milestone. How does it feel to be featured in the IIT Madras calendar back to back? First as Best DDP award and now as Planys? It is not a big deal actually because it is really important and startups might get carried away. It is good to be recognised — when you win an IIT Madras award, lot of alumni will know about you and will be prepared when you reach out to them. Recently, the Economic Times awards happened and 4 out of 5 finalists were from IIT Madras. All jury members and people in the investor circles know you now but at the end of the day, you are making some promises to the clients and you must not get carried away. Your product needs to deliver the value proposition and not win awards for the clients. There are crazy amount of competitions and events for which we have allocated one person from within the team, thus, not disturbing the functioning of rest of the team. If we get it, we get it; if we don’t get it, no big deal! We must realise we are not here for awards but to solve an actual tangible problem. Are you going to hire from IIT Madras this year? We will see. We don’t want to risk getting blacklisted. (… everybody laughs…) The problem is, our requirement is very immediate. When people get placed in December, they join us only in July. Our product cycles do not have such long gaps. That said, we are open to and looking out for people who want to work with us in any kind of engagement, be it an internship, DDP or BTP or just part time work. What message do you want to give younger minds? Typically, students are looking at exit options — job, MBA or MS/PhD. That was the story 3-4 years back. The cog-wheels are in motion now. I have seen a lot of fellow students and juniors who started up in their final/pre-final years, and that is heartening. Working on something which you like and taking risks based on that is a really good way of learning. Institute is doing a lot of things to maintain this ecosystem by providing safety nets. You can defer placements by one year. Opt for MS in Entrepreneurship to get a degree while starting up. It is working on the ecosystem with Nirmaan and CFI. My suggestion to all juniors would be — give it a shot. There is not much to lose. Either try your hands at starting up, or work at a startup. There are about a 100 startups incubated at the IIT Madras Incubation Cell. Go look up the website and see if you are interested in the work done by any of them. Mail them, call them, directly visit their offices to discuss common areas of interest and just start working part time or in summers. Startups in the IC are also looking for talented IITians to join them in such formats. You guys should realise that you are lucky to be placed in the best ecosystem of India. My friends in other IITs crave for such an ecosystem. First we had CFI, now it is evolving into this startup ecosystem. Take advantage of that, it is really valuable and exclusive. Worst case, if nothing works out, you still have your degree and you can always get a job. Editor’s Note: We are not perfect but would love to be. We welcome you to take us closer to perfection by giving your valuable suggestions/feedback on this series at t5e.iitm@gmail.com! !